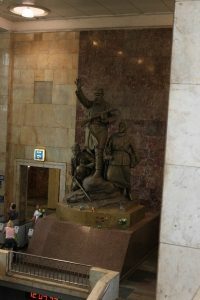 This post is part of a series, a virtual tour of the Depression-era Soviet Union, in part through the eyes of Canadians who traveled there and, in part, through Kirk Niergarth’s eyes as he attempted to retrace some of their steps during a trip to Russia in 2014. The previous installments are available here and here. In retrospect, my linguistic preparation for my Russian journey was woefully inadequate. My online “learn to speak Russian” lessons were not especially effective in real-world application. Even when I could formulate an appropriate question I very rarely understand the answer without elaborate miming. My limited ability to communicate with ordinary Russians was not unlike that of many Canadians who traveled to the Soviet Union during the Depression. Some, such as Toronto social worker Margaret Gould, spoke Russian fluently; others, such as the agricultural expert Andrew Cairns, had enough knowledge of the language to engage in conversation. 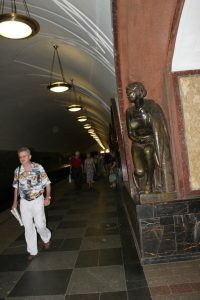 For most visitors, however, conversations with Soviet citizens were mediated by an interpreter or guide. These guides in most cases, were provided by one of the Soviet tourist agencies, Intourist or VOKS. The scholar/journalist Ella Smith hired her own interpreter in England to travel with her for her second research expedition to the Soviet Union in 1932, but she was an exceptional case. I had more conversations with other tourists with whom I took English-language guided walking tours than with ordinary Muscovites, comparing notes with a meat-packing executive from Italy, a crew from a Korean airline, and a honeymooning couple from England (odd as it might seem in retrospect, Eric and Josepha Adams of Montreal spent their honeymoon in the Soviet Union in the summer of 1934). 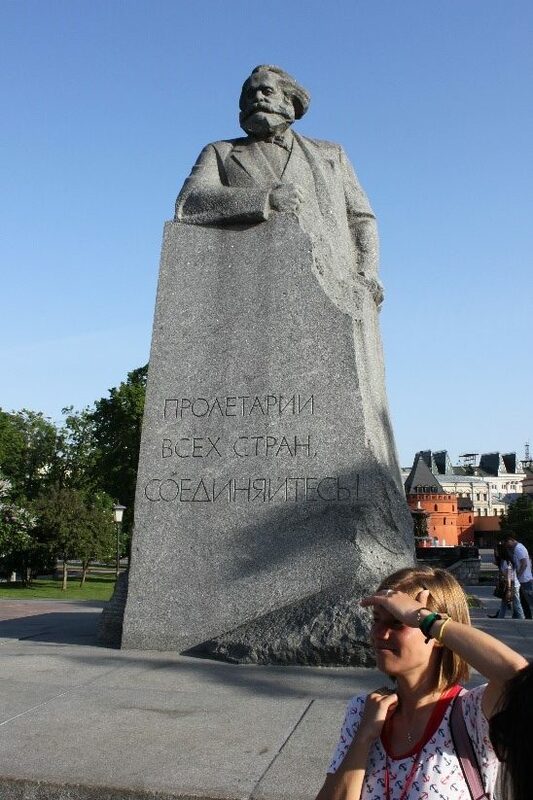 The statue of Marx across from the Bolshoi theatre was a stop on the Stalin’s Soviet Union walking tour in May of 2014. Our guide is pictured in the foreground. My tour’s progressive narrative arc was parallel to an interwar one. The interwar guide would have pointed to the dark Csarist times, noted the current improvements and pointed to a bright future. In 2014, the dark times were Soviet ones, the signs of present prosperity (and conspicuous consumption) the positive steps forward. My guide did not, however, as her interwar counterpart would have, offer any prognostications of dizzying future success. I assume, as well, that she did not file a report on my comments or character after the tour concluded. Nothing symbolized the progressive narrative of a Soviet tour better than a stop at the site of what visitors were told would one day be the Palace of the Soviets. Agnes Macphail, MP, explained on her return to Canada in 1936 how it would “rise to a height of 1,361 feet, topped by a colossal statue of Lenin.” At the time she saw it, however, it was and would remain, an enormous hole in the ground. Inside the Moscow Metro, Mayakovskaya station, 2014. 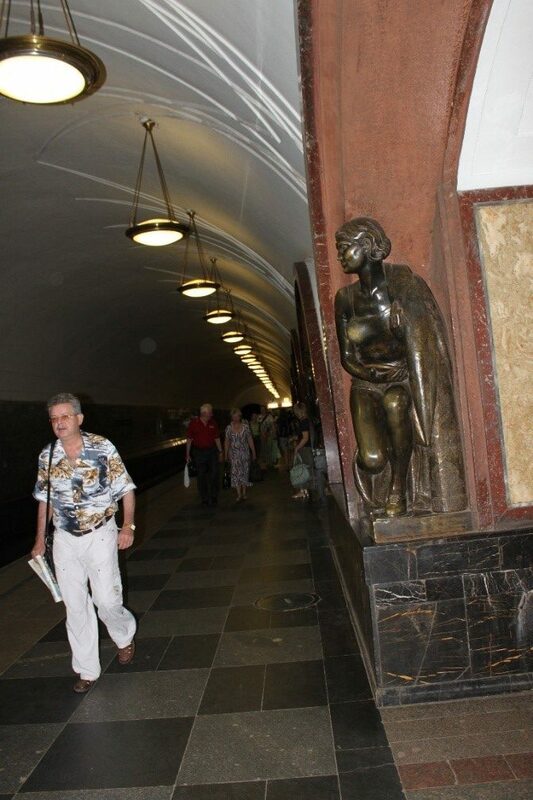 Inside the Moscow Metro, Partizanskaya Station, 2014. 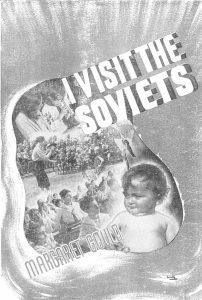 Frank Scott was much less impressed with recently constructed Soviet housing than he was with the Moscow hotel: “This morning we were taken (because we insisted on it: Intourist not particularly liking the idea) to see the new homes for workers, attached to some factory on the outskirts of the city… Entered our first worker’s ‘home.’ It was a small apartment, two rooms and a kitchen. Three beds were in each room, and six people lived there.” Scott was struck by the “complete absence of privacy.” No wonder, he wrote, they needed easy divorce laws. Kirk Niergarth is a history professor at Mount Royal University.